If you’re a small business, finding new customers is always a priority. With a tight budget, it can be hard to do this. You need a resourceful and innovative marketing approach, where you’re closely tracking every dollar you spend on marketing to ensure you generate the ROI you need to survive and thrive. Have a product your consumers love, but you don’t have the budget to tell the whole world about it? We’re writing this post assuming that your marketing budget is close to $0, so you can tackle the initial marketing challenges most small businesses face with confidence. Get out there and talk to your existing customers, not just potential new customers. This is the best way to get a real understanding of what your customers think about your product or service, which allows you to develop your operations to best cater for what your customer precisely wants. To get people to talk to you, take them out for a coffee or a beer. Go with an open mind into these conversations, as all feedback is useful, including negative feedback. It’s important to note that marketing begins with listening to your customers’ needs, and now is your chance to see what makes them tick. If you can’t meet your customers face to face, use surveys on your website, online forums and your social media groups to reach them. If you notice people asking about a product or service similar to yours, make sure to let them know! This can be a great way to acquire customers, especially if you get into the conversation at the right time. Try and search for keywords your customers use to find product alternatives to your competitors, ask for general advice relating to your product or expressing a pain that your product solves. For instance, if you sell flowers, and you find a forum where people are talking about how hard it is to find good flowers on Valentine’s Day, enter the conversation and offer a solution. Aim to talk to as many people (both existing and potential customers) as possible. Always be ready with your elevator pitch to get the attention of potential customers through clear communication. This can do wonders in creating a great first impression, which is especially important in the initial stages of your business growth. In all these conversations, it’s highly recommended that you ask relevant questions and let your customers do the talking. Make your customer conversations natural, and send each person a thank you note for their time afterwards. This goes a long way in building long lasting relationships. Email is still one of the most low-cost, measurable and effective marketing channels. 44% of email recipients make at least one purchase based on a promotional email. That doesn’t necessarily mean you should use email to sell your product, but it’s a sign that email marketing actually works. The only cost involved is the time it takes to do email marketing well. You can use email marketing to reach your audience directly, establish credibility, position yourself as an authority and engage with customers. Start by ensuring you have an email subscription box on your website and blog, to ensure you make it really easy for customers to sign up to receive your emails. It’s important that you only send marketing emails to customers who’ve opted in to receive them; becoming a spammer can kill your brand. By using a service like Mailchimp or Aweber, you can collect up to 2000 email addresses for free and run campaigns to engage your recipients. The best way to do email marketing is by starting a customer newsletter, that’s jampacked with information they would love to know, sharing promotional deals and any relevant updates to your business. Your goal is to make customers fall in love with your business and look forward to your emails. 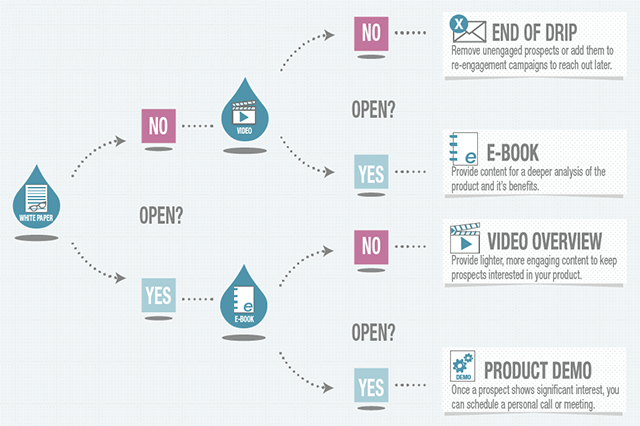 A popular approach is using a ‘drip campaign’ or a sequence of emails that slowly expose your product to your audience. They can help with converting dormant leads to active customers. Through regular contact (once a fortnight is recommended), you stay on top of your prospects minds, and eventually win their trust. With tools like Vero & Customer.io, you can send emails to specific segments of your prospects, like the ones who are existing customers, and the ones who are dormant leads. The icing on the cake for drip campaigns is that it all happens automatically once it’s set up, depending on the user actions that trigger each email in the sequence. Zapier, an app integration software tool, sends a drip email sequence to their customers the minute they sign up to the platform. This is to provide them with the resources they need to understand the platform and use it effectively. You can use automated email sequence campaigns for upselling existing customers, asking for referrals too, reminding people of completing their purchase if they’ve abandoned their shopping cart (very useful if you’re an ecommerce business), subscription renewal notices, and much more. Create local awareness in your area about your business. You can do this in several ways cost effectively. Contribute articles to your local newspaper or trade magazine to get some press coverage among people in your area. They’re more likely to transact with you, by virtue of your proximity, especially if you’re a local business selling physical products. Make sure you create a free listing on local search directories, like Yellow Pages and White Pages. Definitely make sure you get on google my business, to be found by customers across devices, on google maps or on Google+. Reviews on your Google+ page act as ‘social proof’ for your business, so make sure you ask customers for reviews. You can also respond to customer reviews on Google+ and engage your customers via an online chat. Don’t be tempted to hire a professional PR agency at the start, as they can be expensive and may not yield an ROI to your expectations. You’ll probably find you can do a lot of your business’ PR yourself. If you can get it right, this can be an absolute gold mine of a marketing strategy for a small business. The idea is to partner with another non-competing business, with the same target market as you. For example, if your business provides foreign exchange services, it makes sense to partner with local travel agencies, who have the same target market as you, i.e. travellers. To make this work, you need to be able to create a win-win-win situation. This is when all parties in the partnership, i.e. you, your referral partner and the customer, ‘win’ through collaboration. Clearly establish the value you can provide to your partner for each customer referral they send your way. Your partner needs to see the value in sending potential customers to you, so it’s vital you get this right. Some ideas include giving them a percentage of the sales you generate, or incentivising each referral with a reward. If you create a partnership, you’ll have an ongoing stream of leads to your business with minimal active marketing effort. A great example of a small business/startup that’s been able to reap the benefits of this strategy is PostMates. 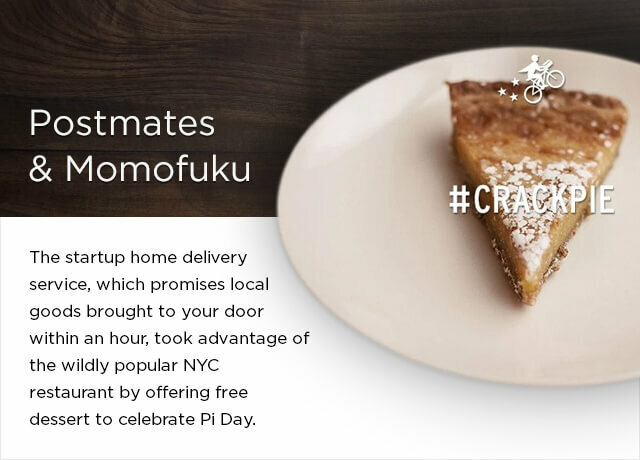 It’s an on demand food delivery service, that partnered with a popular NYC restaurant, Momofuku to take advantage of their customer network by offering free dessert to celebrate Pi Day. By piggy backing off the traction Momofuku already has, Postmates has been successful in acquiring many new customers. If you can make a strategic alliance work, it can be a great business growth propeller. By providing a great product consistently, combined with impeccable customer service, you can make your customers your ‘marketing agents’. You want to be in their best books, so they can talk about your business positively. While word of mouth is something that happens organically when you provide great service, there are some steps you can take to spread the word. For instance, send each one of your customers a “Thank You” note for their business. A fashionable new company called HEX, built a thriving business based on this strategy. They sent over 13,000 hand written thank you notes to their customers. This acts as a great sweetener to end a customer interaction, and ensures they’ll keep you in mind. Many of their customers were so pleased to receive this, that they shared the note on their Instagram and Facebook accounts. And when something like that is shared by a customer on social media, that’s huge. Most people know at least 200 people. And those people would know at least 200 people too. That’s 40,000 potential contacts! By sharing positive customer interactions on social media, you can amplify your reach and attract new customers. Send thank you notes as a surprise to your customers, and don’t include anything commercial in it. You’ll notice the positive response you get by just being ‘human’ with your customers. Be unconventional in your marketing approach when you’re a small business. If you want to grow big, you’ve got to stand out from the crowd. Use the above marketing hacks and take your business to the next level, without breaking the bank.